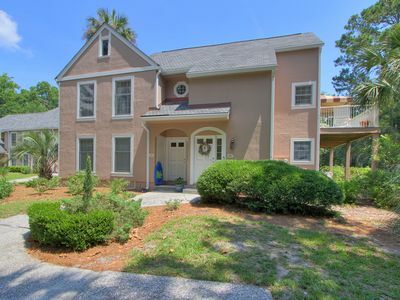 EXCEPTIONAL Villa in Palmetto Dunes! Best Privacy & Best Views! 5-Star Reviews!! 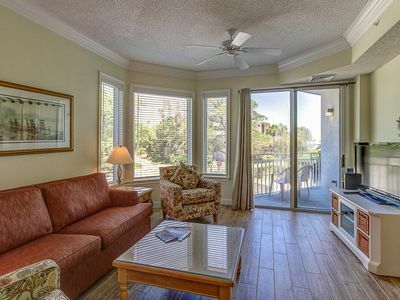 Welcome to our spacious, remodeled and designer decorated 2nd floor, 2-bedroom Villa in the award winning, prestigious and gated Palmetto Dunes Oceanfront Resort on Hilton Head Island. 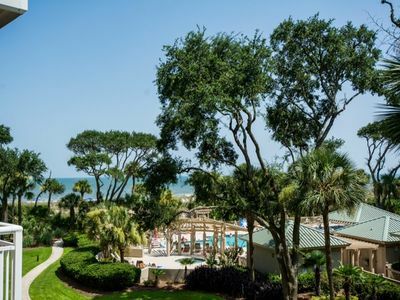 Palmetto Dunes was named one of the Top 25 Family Resorts in the World by Travel and Leisure Magazine. 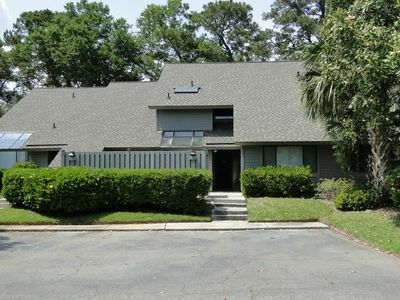 Our villa is located right on the golf course in the extreme southern corner of St. Andrews Common which is furthest from roads, and other units. 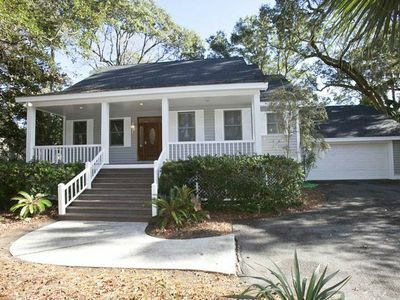 It has the absolute best views and it's in the quietest, most private corner of St. Andrews Common. The commercial vacation rental companies all wanted our villa, but we decided to list on Home Away / VRBO and give you a MUCH better price. NOTE: This is NOT the much smaller 2 bedroom unit with the small deck and the 2nd bedroom in a loft with a spiral staircase. This is the largest and most luxurious 2-bedroom villa in St. Andrews. You'll need to visit to appreciate this exceptional, spacious and truly unique 1,400 sq. 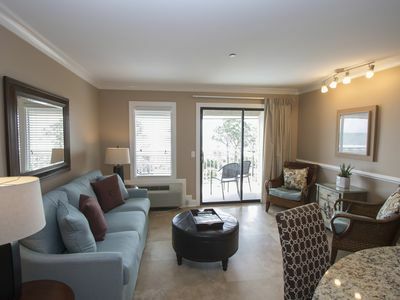 ft., 2-bedroom, one-level villa with its cathedral ceilings and stylish decor. You'll be in your own, private tropical paradise with spectacular views in every direction. 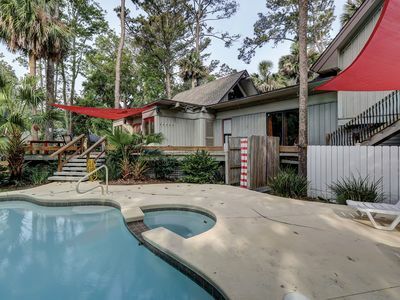 A huge Magnolia tree, various Palms, Palmettos, Live Oaks with Spanish Moss, other tropical plants and a small lagoon frame beautiful views of the George Fazio Golf Course. There are no other villas, parking lots, walls or other obstructions to spoil your privacy and the tropical scenery. This is exactly why we were willing to pay a premium price for this premium St. Andrews Common villa. If you need a place to STAY, get a hotel room. If you want a place to really LIVE on the Island, this is your villa! Our villa is professionally decorated and furnished in the Tommy Bahama style with tropical floral fabrics and art and tropical wood appointments. You'll be impressed with the open floor plan and atrium windows that fill the living spaces with light. The afternoon sun is filtered by the large beautiful trees, just off the deck, which provide a totally tropical feel. You'll prepare a glass of wine or a drink at the eight-foot long wet bar which separates the living space from the dining space two steps above. 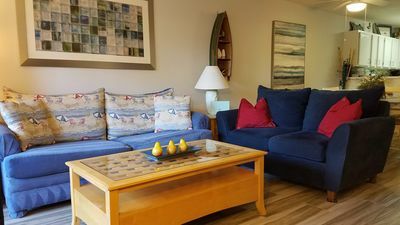 The 42-inch Panasonic, high definition flat screen television is perfect for viewing the extended high-def channel selection; watching a DVD on the Panasonic Blue Ray player; or reviewing your day's beach photos using the TV's built-in photo viewing features. The furnishings throughout are high quality. The sleeper sofa will accommodate a 6th person or a couple of children. Morning coffee or sunset with a cold drink are absolutely perfect while sitting in one of the bar-height, bistro chairs on the spacious, private wrap-around deck. The deck has room for everyone in the party with six chairs (four bar height) and three tables. 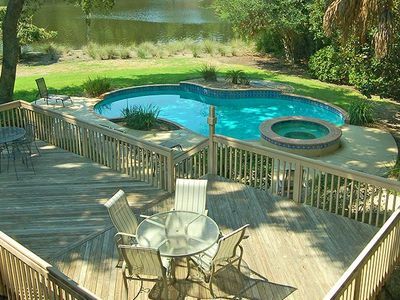 There is also a BBQ grill on the deck for preparing a perfect steak or fresh fish. 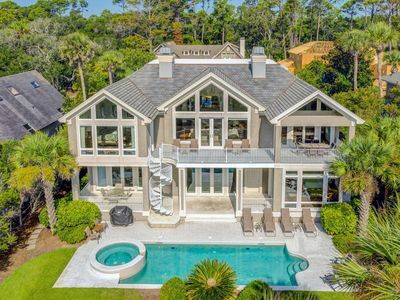 You'll find a private retreat in the master suite with high ceilings, golf course views and separate french door access to the villa's large, wrap-around deck. Everything is fresh from the tile, granite, vanities and fixtures in the bath to the furniture and 32 inch flat screen hi-def TV. Woven woods provide privacy for the windows and deck doors. Our designer advised that we should give special attention to the bedding as a good night's sleep is very important for us and our guests to fully enjoy our time on the Island. You'll sleep on the best, most supportive and most comfortable king mattress and foundation that we could find. The roomy second bedroom also has beautiful, high quality furnishings and shades to provide privacy for the windows that face the front, entry-side of the villa. This bedroom has a queen bed for couples: an extended-length twin bed for another golfer or family member and a 24 inch flat screen TV/DVD combo. The bedding is the same high quality bedding that we chose for the master suite. The hall bath, just outside the second bedroom, has also been completely renovated with new tile, vanity and granite. On days when you choose to eat in, food preparation will be a joy in the well equipped kitchen all new appliances and refinished cabinets. 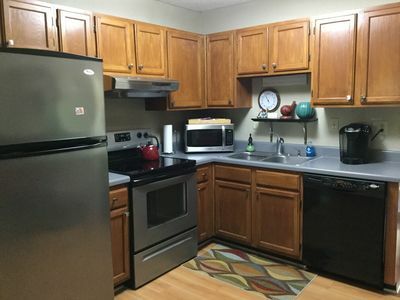 The refrigerator has filtered water and ice in the door and the range is a state of the art INDUCTION cook top and CONVECTION oven. Both are stainless steel. All pots and pans are brand new. There is a new tile floor with the original tile counter tops and back splashes. 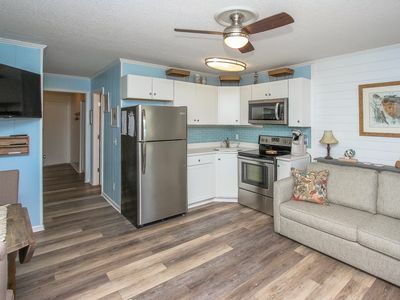 You can wash your clothes and beach towels in the full size washer and dryer just off the kitchen. Behind the kitchen and near the villa entrance is a study with new desk, chair and artwork. 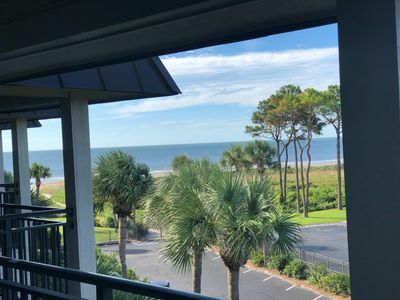 This is a perfect place to open your laptop, access the villa's private wireless network and make that reservation at your favorite Hilton Head Island restaurant. There is also a printer for your use. There is also a small covered deck off the study with two chairs and a small table where you will find a private space to read a book or have a private conversation. 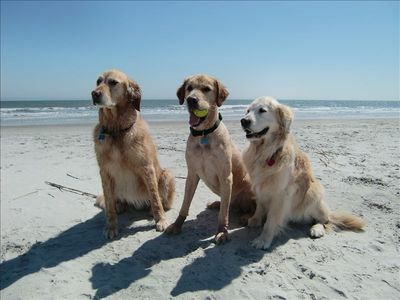 St. Andrews Common is part of the exclusive Palmetto Dunes / Shelter Cove Resort, one of the world's best resorts. 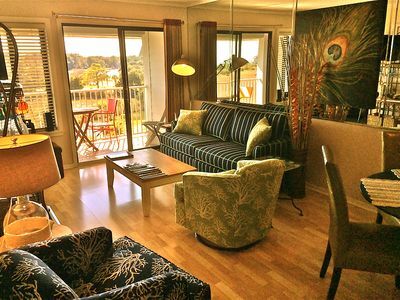 The Resort offers exciting amenities and you will receive a Resort Pass which will give you driving and parking access to all areas of the Resort and all that this exceptional destination has to offer. 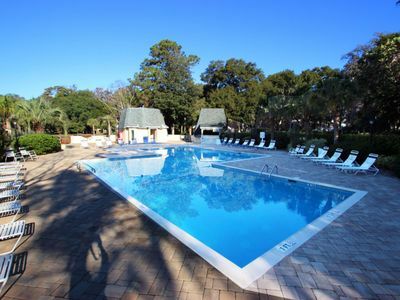 Play golf on one of the three world-class golf courses or enjoy tennis at the award winning Palmetto Dunes Tennis Center. Bike the miles of trails using the two cruiser bikes at the Villa for your use; shop at Shelter Cove's markets, shops and restaurants; take a cruise, charter a boat or fishing trip; kayak in the 11-mile lagoon; fish in the surf or lagoons; dine in the many restaurants; catch a show at the Arts Center; take a short walk or bike ride to the beach or park at one of the private beach access points. 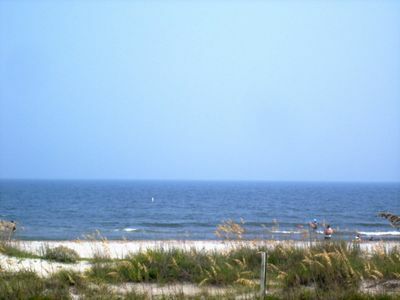 All of this is available within the Palmetto Dunes / Shelter Cove Resort and you will have access. 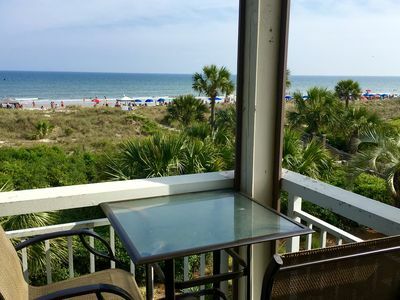 I addition to the two cruiser bikes at the villa for your use, you may rent additional bikes, kayaks and other items from The Outfitters in Palmetto Dunes at a 20% discount as a "Preferred Guest" with the code I will provide. Don't feel like walking, biking or driving? Call the “Dunes Buggy“ and one of the buses will pick you up at your villa and take you anywhere in the resort for no charge. Call again and they'll take you somewhere else or back to your villa. This transportation is available April 1 till September 30, from 8 AM till 9 PM for guests at our villa. 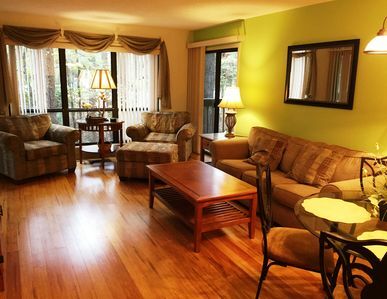 Feel like staying very close to home? You can also relax in one of the comfortable lounge chars at the large and beautiful St. Andrews Common swimming pool and pavilion available exclusively for St. Andrews Common owners and guests... about 100 steps from your villa door. 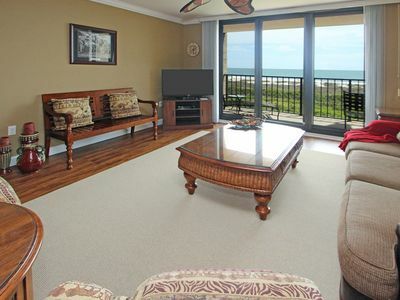 Breakers Direct Oceanfront - Best Ocean View on the Island! Book your spring vacation now! Lots of upgrades, Gym Included! 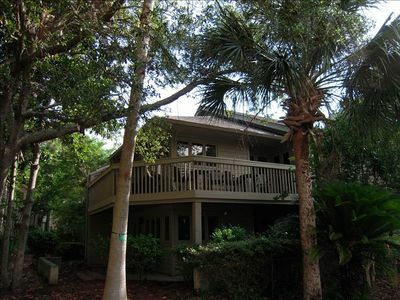 9 Cat Boat-OCEANFRONT and so much MORE! A relaxing getaway with shared pools and hot tub in an oceanfront villa.